Most people have no clue how to change a flat tire or don’t actually want to know. Studies show that many people are afraid to even try. Well, here is the perfect solution. Many of us have heard about tire inflation products, which tire technicians often hate. I found the perfect answer to everyone’s concerns; the Slime Safety Spair. This flat tire repair system is as simple as pushing a button. I was able to fix my flat in 7 minutes in snowy weather. I was sold. It was safe, easy and fast. Best of all, the Slime product, unlike others, is one that is NOT flammable and can be rinsed out with water by a tire tech. Now everyone’s happy. Sure it’s best to replace the flat tire with a spare tire, but the Saftey Spair was great because it includes a powerful 12V air compressor that fully inflated the tire. 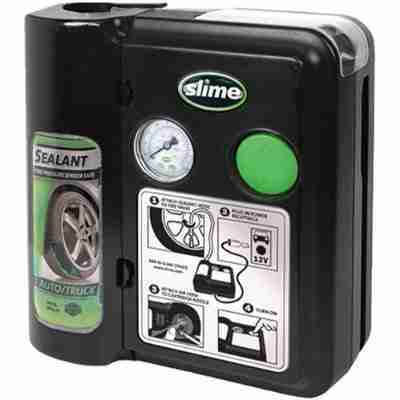 It seals punctures up to 1/4″, includes a safety light in case your flat is at night, the repair is guaranteed for up to 500 miles and it doesn’t harm tire pressure monitoring systems. This is a perfect gift for any driver and I have one in each of my cars. I found mine at Target for $49, but check your local stores and online for great prices.